There is no single formula or template for developing a strategy right for a business. Business strategies, internal operational structures and obviously corporate cultures vary enormously and the legal department needs to reflect this. However there are common themes, the likes of Tyco and DuPont have implemented very successfully. Lean methodology, process control, and PRINCE2 project management are all processes that the engineering sector is familiar with. But how are in-house legal teams responding to the increasing pressure to demonstrate the value of services provided to the business functions and key stakeholders? As legal costs continue to climb, financial pressures are leading many industrial engineering companies to instigate spend reduction programs and demand more from their legal functions. In many instances, the message could hardly be clearer from their Chief Financial Officer and CEO: ‘Get the costs of your Legal department down and under control or face the consequences’. This is often forced upon the General Counsel (GC) who often lack the time, data and analysis to justify their own internal spend. Legal department strategies are often reactive, with cost reduction being a focus without the knowledge or insight into how this could be achieved effectively. Without doubt, legal teams should be compared, evaluated, judged, categorised, ranked, and balanced, as with any other business unit in a company. However, measuring value is seen as a challenging process for an in-house legal team. There may be concerns around the right resourcing at the right level, the introduction of bureaucracy or inadequate returns for the department. A simple and practical strategy with the right systems and collective approach can be introduced to clarify objectives, improve performance and importantly begin to measure and demonstrate the value that legal spend is providing the overall business. Such systems, tools and frameworks should make it easier to run an in-house legal department, and may also make it simpler to identify areas which GCs and other senior in-house lawyers can attain leadership. However, these systems all flow from a well defined strategy, something that many in-house legal teams lack. An ongoing challenge is obtaining recognition from the business that the in-house team adds tangible benefits to the organisation’s market position and future growth. A clear, well defined strategy for the legal team is vital. It will help achieve the company vision, mission statement and embed the values of the organisation at the heart of the in-house legal team. So, what is the starting point for developing a strategy for an in-house legal department? Many in-house legal teams are reactive and respond to legal demands from the business in an ad-hoc manner. This is a strategy that is forced upon them due to time pressure, budget constraints and lack of understanding in how to best structure the legal department. Following this strategy leads to increased costs as work is poorly defined, poorly structured and often sent to panel firms without knowledge of whether they are suitable to undertake the work. The first step in developing a strategy is to recognise the current methods the legal team use and what the subsequent issues are. A legal department maturity model can be followed to ascertain how effective a legal team is against other in-house departments. The legal maturity model acts as a high-level benchmark for understanding the current stage that the legal department is in and what to focus on to build a fully-optimized department. 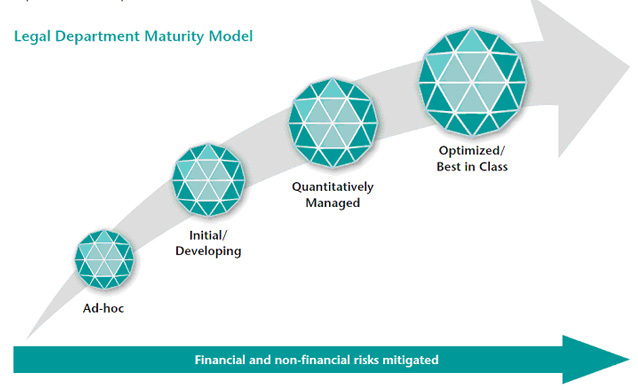 The first step is to measure the department against the legal maturity model below. It will identify the current ‘as is’ state and identify the steps needed to arrive at the optimized or ‘best in class’ model. This can be undertaken through simple online feedback surveys from business units and with the legal team itself. Following the completion of the analysis and benchmarking phase of the current operation, steps can be taken to map it against the future vision and mission statement of the legal department to develop the ‘to-be’ model. The key to any strategy is ensuring that those feeding into the development are relevant to the success of the in-house legal team. Many strategies have been developed solely on the thoughts and ideas of the in-house legal team, which then finds it difficult to implement with business units who do not require the strategy outputs that the legal team believe are necessary. Furthermore, many strategies are developed that set out to achieve fixing the issues that the department currently faces. These strategies quickly become outdated as the business environment changes, and the pressures on the legal department shift focus. The legal strategy should follow the vision of the business, and prepare the team for what the business will look like in 3 years time. The creation of a strategy map is probably the single most important step in building a Lean legal department and a starting point to getting more from the legal budget. With this in place the business units and legal team can progress effectively with the clear road map in place to measure those incremental advances. The perception that the in-house legal team is expensive and doesn't create value does not need to be a reality. There is much that can be done to change or prevent these situations. With a strong resolve, the right support and firm hand, developing a strategy can quickly get more from your legal spend while increasing quality of service at the same time. Eversheds Consulting, a division of Eversheds LLP is working with a number of FTSE 100 and Fortune 500 companies designing and implementing strategies to get more value from their legal spend without compromising on quality or risk and freeing up time for you to have a strategic overview of your legal department. Eversheds Consulting offer a uniquely broad and integrated range of services to Global General Counsels - strategic, management, work process and technology, benchmarking, and best practices. We have deep legal functional experience in specific areas, such as legal risk & compliance management; contract management; records management; corporate secretary and Legal Spend. Our consultants have completed consulting projects with numerous legal departments – global as well as in the U.K. - in numerous industries and sectors – e.g. private and public companies legal departments at all levels of corporations, government-sponsored and not-for-profit organisations. Outside the U.K. we have unmatched experience working with clients in the private sectors in Europe and United States, Middle East, Africa, Australia and the Asia Pacific region.